So now you know that you want it, let’s install it! This will now run and hopefully you’ll see lots of ‘OKs’. If not it should tell you where the problem is, some problems you’ll be able to fix (correct dirvers etc.) 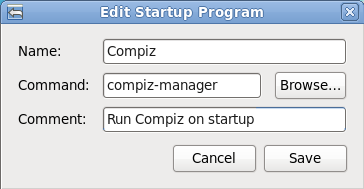 some sadly can not be fixed, and in that case Compiz won’t run on your computer. Desktop Cube and Rotate Cube (under Desktop options). 3d Windows and Wobbly Windows (under Effects options). As with everything else, as I said, just fiddle, it is easy to turn them on and off without any problems. Don’t forget you will need to your computer and when it boots back up Compiz should be running and your beautiful desktop effects will be in place! This entry was posted in Linux and tagged Compiz, Linux. Bookmark the permalink.